On 10 July, the Eastern Partnership Civil Society Forum Working Group 5 “Social & Labour Policies and Social Dialogue” held its annual meeting in Brussels, allowing for meetings between the 18 representatives of the EaP CSF WG 5 and stakeholders from DG Employment, Social Affairs & Inclusion (DG EMPL) and the European Economic and Social Committee (EESC). 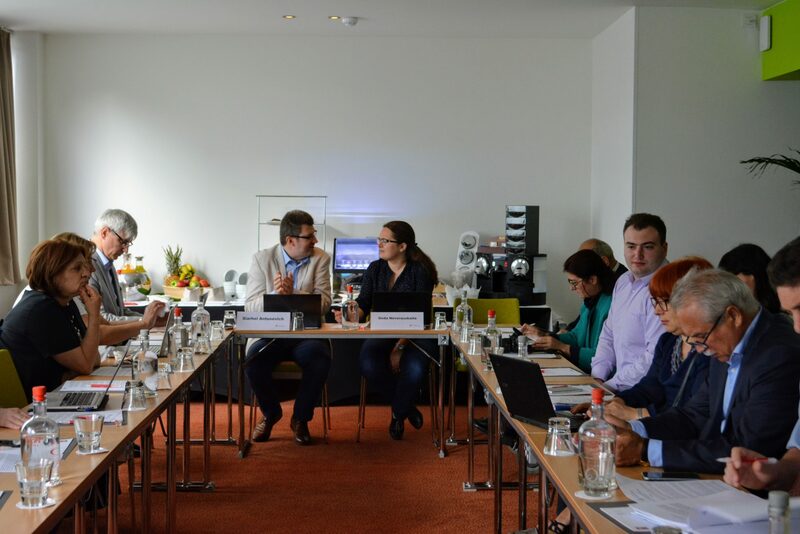 The meeting was opened by WG5 coordinators Goda Neverauskaite and Siarhei Antusevich and continued with coordinators of the subgroups, all summarizing developments and challenges in their respective countries. Often mentioned topics were the development of social dialogue, the state of social security and pension systems, the labor code, together with the recent reforms being promoted in such fields in all EaP countries. Following the presentations of EaP CSF regranting projects, Darya Mustafayeva, Communications Manager at the EaP CSF Secretariat, provided an update of the EaP Index, which will be officially presented in Brussels in September and in Tallinn in October, during the Annual Assembly of the Forum. The afternoon session started with the interventions of two external stakeholders. Fréderique Rychener, from DG EMPL, focused on the main challenges and priorities of the EU employment and social policy. As she outlined, during the last 5 years improvements in the labour markets were registered and the employment rate gradually rose, even if substantial differences among member states still exist. She also mentioned that gender gap is slowly closing, even if employment rates among women are still lower than among men, and that another issue of concern is the high number of people still at risk of poverty and social exclusion. She concluded her presentation by mentioning EU programmes developed in order to counteract unemployment, especially among young people. The most recent initiative is the Open Pillar of Social Rights, based on fundamental principles such as equal opportunities and access to labour market, fair working conditions, social protection and inclusion. Andrzej Adamczyk, from the EESC, presented the Joint Civil Society Platforms established by Association Agreements and the Domestic Advisory Groups focusing on trade in the context of sustainable development in DCFTAs. 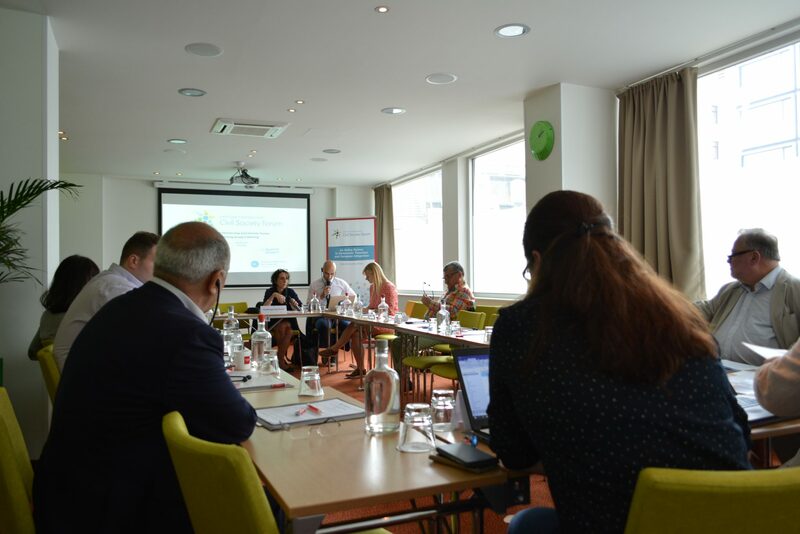 According to him, the Civil Society Platforms’ role is particularly important because of their bilateral nature, as they are composed of both EU officials and civil society experts from the EaP country concerned. These will be fundamental also in the implementation of the DCFTA, as they will be periodically consulted by the authorities. A Q&A session followed the two speeches and the remaining sessions of the meeting were dedicated to internal discussions on EaP CSF Strategy, Alternative Civil Society Declaration and the Annual Assembly of the Forum, taking place in Tallinn on 25-27 October 2017. Finally, members voted and adopted a statement, calling on the EaP CSF Steering Committee, the participants of the 9th Annual Assembly of the EaP CSF, the European Commission and the European Economic and Social Committee to intensify their collaboration, to acknowledge the value of WG5 work and to recognize the unique importance of social dialogue and labour for the realization of the common strategic tasks of the Eastern Partnership as a whole.